Pittsburgh, PA – March 7, 2017 – Janney Capital Management, a professional investment manager that offers discretionary, fee-based, separately managed account solutions and subsidiary of Janney Montgomery Scott (“Janney”), received a one-star Top Guns rating for active index strategy from Informa Investment Solutions’ Plan Sponsor Network (PSN) for the period ending December 31, 2016. Janney Capital Management, which is based in Pittsburgh, P.A. and oversees more than $3.5 billion in assets for individuals, corporations and institutions, began managing active ETF portfolios in 2001. 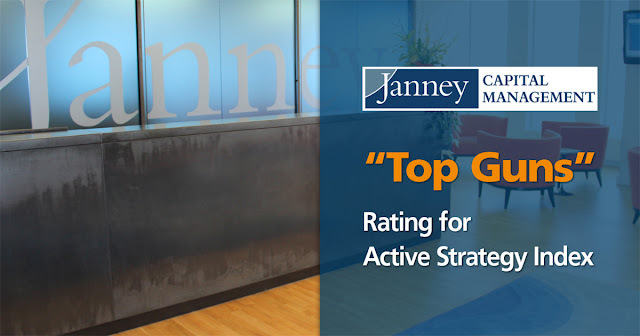 Janney Capital Management has received the PSN Top Guns three-star rating for the fourth quarter of 2013, six-star rating for the first quarter of 2013, the first, second and third quarters of 2012, as well as year-end 2011. Inform Investment Solutions first introduced its Plan Sponsor Network (PSN) in 1984. PSN offers financial professionals high-quality data on domestic and international investment managers. Approximately 2,000 investment managers participate in the PSN database, which covers a total of 20,000 investment products. PSN Top Guns performance rankings are tabulated for thousands of strategies across peer groups and top performers are strictly based on quarterly returns.